The 10 seashells in this collection were retrieved from the sandy and rocky floor of the Pacific Ocean adjacent to Port Macquarie, by Cec. Radley, a local commercial fisherman. They were retrieved in nets or baskets when he was trawling for prawns, lobsters and fish in ocean waters during the 1950s. They are all in perfect condition and were found at depths varying from 100 metres to 250 metres. Eight (8) of the shells are “Volutes” which are members of the ‘volutidae’ family of which there are some 200 species. 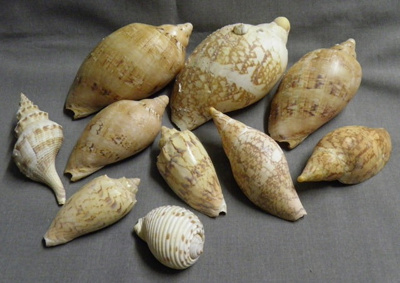 They are considered to be rare to very rare, and are some of the most expensive shells in the world. They are often referred to as the aristocrats of the sea because of their beautiful colours and striking patterns. The Australian Spindle shell is one of about 200 species of the “Fasciolaridae” family. These are large carnivorous snails found mainly in warm shallow waters where they are abundant in numbers up to 100 metres. On the other hand, the smallest shell in the collection, the Tun shell from the “Tonnidae” family, is one of only 20 species worldwide and considered to be very rare and very valuable. Seashells have held a fascination for people of all ages for centuries and many consider that seashell collecting is one of the most interesting and rewarding hobbies in the world. Mr Radley comes from a long established Port Macquarie family. His father and five brothers owned three fishing trawlers and they were all involved in the fishing industry in Port Macquarie for more than 60 years. It was during this time that Cec. developed a lifelong interest and appreciation of the sea and the treasures that lived beneath the surface. This collection represents his interest in shells, but merely in the form in which they occur in nature. Cec. collected specimens with attractive shapes and colours, and because there were often large numbers of them caught up in his nets and trays, he was able to be selective, keeping only those that were rare and valuable and in perfect condition. He also kept records of where each shell or group of shells were found, and the depth of water in which they were caught. Because commercial fishermen work in rough and harsh conditions and spend many hours at sea, they might often be perceived as not having time to be involved in any hobbies outside of the fishing industry. However this collection and the notations that Mr Radley has included with it, indicates that the sea and the ocean environment not only provided him with a livelihood, but with a lifelong interest and appreciation of the extraordinary creatures below its surface.